Off-season is over and Saturday April 13th it’s time to play ball when Helsinki Roosters meets Stockholm Mean Machines on Helsinki Velodrome. 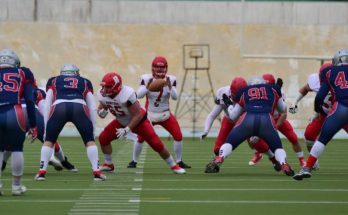 Last year it was a practice game but this year the stakes are higher, as the game is a North European Football League game on the road to IFAF’s European Club Team Championship Game. 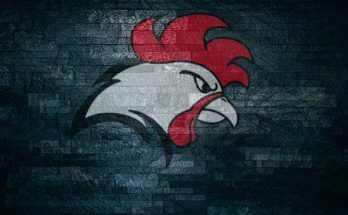 There have been some changes in Roosters’ coaching staff and player rosters and fresh head coach Mikko Koikkalainen is eager to get going after solid off-season. – We started our preparation Sunday and will have our normal game week schedule. 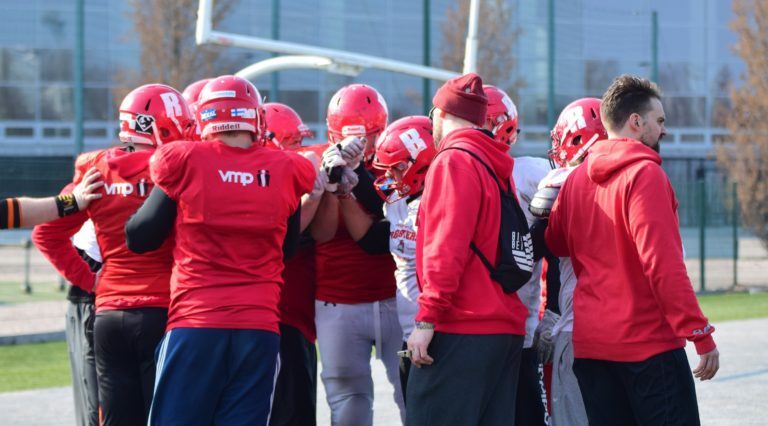 Our off-season practices have gone well and now we are eager to see how we match up against Stockholm. Teams met last spring but Stockholm Mean Machines has since improved from contender to reigning Swedish champion. Mean Machines played their first game in 2019 Swedish Super Serien and won long time power house Carlstad Crusaders with clear numbers 33 -13. Koikkalainen, who is also coordinating offense, was impressed by what he saw. – Stockholm’s defense played very well against Carlstad in their season opener. They have signed some really good players and especially their defensive backfield is looking great. That doesn’t mean that there are weaknesses elsewhere, they have real solid group of players all around. – This should be a fun game. Mean Machines looked really impressive last week. Our team has gone through a small turn around and we will see where we are right now. Our players have put in the work, now it’s time to have fun and play, says Koikkalainen. Stockholm’s head coach Fredrik Pilbäck is satisfied how preparing for the season has gone and hopes better result than last year. – Very well, better than planned. The scrimmage vs. Eidsvoll (1814’s) worked well. The game vs. CC did actually go better than we thought it would go. We will face a top 5 team in a tight game. I really hope that we can put up a good fight. Their offense was lethal last year. And their defense took them all the way to beat Vienna (Vikings) for a top 5 position. Pilbäck expects a hard game. – It will be a dogfight. The team that can handle the pressure will win. Least mistakes will win. Turnovers, time of possession and penalties will be really important. Roosters’ defensive coordinator Kalle Karppinen is known to build solid defenses and he also knows that mistakes can be costly in the end. If he were a gambling man, he’d put his money to a close game coming Saturday. – Preparation for Saturday’s game is progressing well. We have had some injuries to key defensive players during the spring, but hope to be at full strength for the season opener. Stockholm plays a relatively straightforward spread offense, so I think it will eventually come down to match-ups and execution – who wins the one-on-ones, who makes the big plays, and who avoids the mistakes. I’m looking forward to an exciting high-quality football game with the Roosters coming out on top at the end after a solid defensive performance. Like any other years there have been changes in player lineup. Some players have retired or gone to other teams, and some players have come. 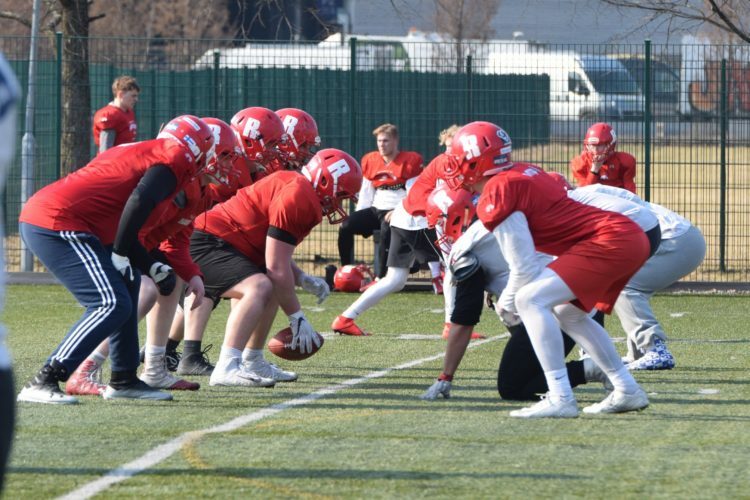 Every year there are also possibilities for new players to step up and although line backer Akseli Vartiainen have already played couple of seasons in men’s team, he is one of the players getting much bigger role in this season. He is satisfied for off-season and is ready for the challenge from Mean Machines. – Off-season went well. Some changes in the team, couple of big players left, but we have replacements and players from last year have stepped forward. Of course we are going there to win, but it’ll be a tough game. First game of the season, so there will be some mistakes, but we’ll go forward. Comparing to last year, Stockholm is much better team, so I don’t think it’ll be as easy game as then. They are coming to compete and try to win. It’s always balancing with imports, how many there will be in the team, and it changes from season to season. This year on defensive side of the ball Camille Gruel is the only one. He has had time to adapt to new team. – The off-season went really well for both the team and myself. We started to practice pretty early before the season with good preparation and conditioning. Mika Mäkynen, our physiotherapist, is taking care of us very well and he is doing his best to keep all of us healthy. I won’t say it was difficult for me to adapt to the Helsinki Roosters. I knew a few guys and the coaches (had been playing in Finland since 2015). We have coaches for each position, practices are well prepared and we get the job done. Guys always show up to practice and we do a lot of stuff outside football too. In simple words, I like the team. The French player has played in Finland earlier for Turku Trojans and Helsinki East City Giants, but was hampered with some injuries in those seasons and Saturday he wants to show that he is not in vain here. – Like I said I have played in Finland since 2015, so people know me. I had been injured last season and missed the international games with the French national team. Those international games are a good test for me and I’m really excited about them. Plus I’m the defensive ”import”, my job is to show up, nothing less. Get the win and get the job done. I’m so excited about playing my first home game with my new team and prove them they can count on me. Just watch #3. Last year wide runner Adam Connette played his first game for Roosters against Mean Machines. He is glad it is time for real football. He says that playing as a team comes success. – Off season went good. I think everybody are glad that it’s over and we can start preparing for another team, so now everybody are excited it’s getting closer to game day. For every single game you go with same exact expectations; just playing hard, doing what my job is, not having to do anything extra that will make me mess up, anything like that. If the whole team put that together, we will succeed. He anticipates a different game than last year. – I expect it to be tough fought out game. Lots of offense, defense and turnovers will be a huge part of the game. I think whoever wins the turnover battle will probably be on top, Connette says about the result of the game. Last season Tony Koskinen gave snaps as center, but changing to guard gave some more interest for his off-season training. – I’m in good mood after off-season. My position changed, which made it more interesting. Some top veterans left and we’ve replaced them with our younger players, so I’m looking forward to what they can show in coming game. Overall off-season went like it should have to, and our new head coach Mikko has done his job very well as have the other coaching staff. – As for Stockholm, I haven’t seen their game tape yet, but last season they had very good individuals in the team and they’ve got some good Finnish players to their secondary. Last season they had really tough defensive line and I guess that they are coming with force and there’ll be some good wrestling with them. Running game will be really fun, Koskinen ponders coming game. Some speculations have underrated the strength of this season’s Roosters’ roster, but Tony Koskinen will happily prove them wrong. – I don’t think there is any need, but we are ready to prove that we are still the best American football team in Finland, and we’ll beat the Swedes. Helsinki Roosters vs. Stockholm Mean Machines will be played at Helsinki Velodrome on April 13th. Kick off 12:00, gates open 11:00. Tickets: adults 15 €, special groups 10 €, children under 12 years free. Game is streamed live by SolidSport with fee 5€. Ottelu nähtävissä suorana netissä SolidSport kautta 5€ maksua vastaan. 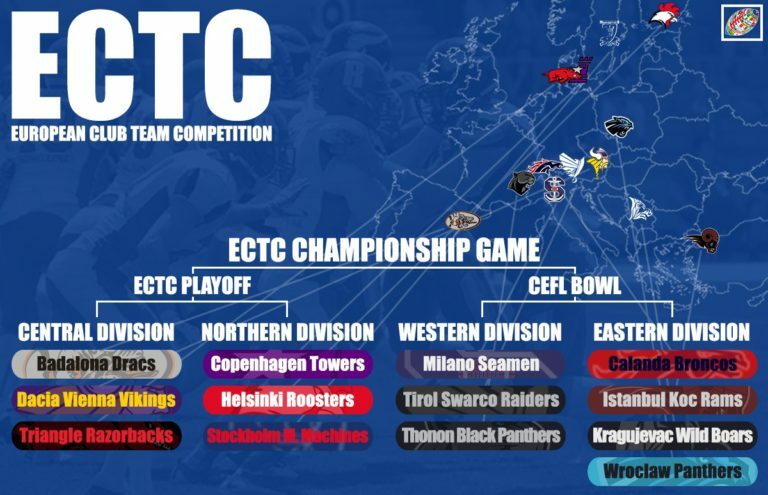 IFAF’s European Club Team Championship will be competed in for divisions. Northern and Central division winners meet each other in playoff game as will Western and Eastern division winners. Playoff winners meet in Championship Game.